The development of telecommunication technology in the 21st millennium has significant increased the speed and quality of which people communicate and gather information. The Internet as one of the new tools for telecommunication has become immensely popular around the global. As author Greenaway states in his (her) research, there is a growing “patterns of Internet use among rural and urban dwellers [in Canada]”. (Greenaway, 2004, para1). Statistics provided by The Daily provided data to support Greenaway’s finding, as it reports that Internet usage in small-towns has increased from 58% in 2005 (Statistic Canada, 2007, para4) to more than 79% in 2010 (Statistic Canada, 2007, para1). As the Internet is becoming extremely popular in even some of the isolated areas in Canada, it would be interesting to investigate whether Internet usage in Canada’s urban areas is more than its rural counterparts. Is Internet more popular in cities than rural towns? Many statistical studies and reports seem to support the fact that Internet usage in urban cities is higher than smaller towns. For example, a table provided by Statistic Canada shows that in 2007, 92.6% of urban civilians used E-mail for telecommunication, compared to 89.2% E-mail usage in rural areas (Appendix D). Furthermore, a different table of Statistic Canada shows that urban areas’ Internet usage is higher than rural areas in both 2005 and 2007 (Appendix D). What are the reasons for this difference among urban and rural areas? The main causes for the disparity will be discussed later in this paper. 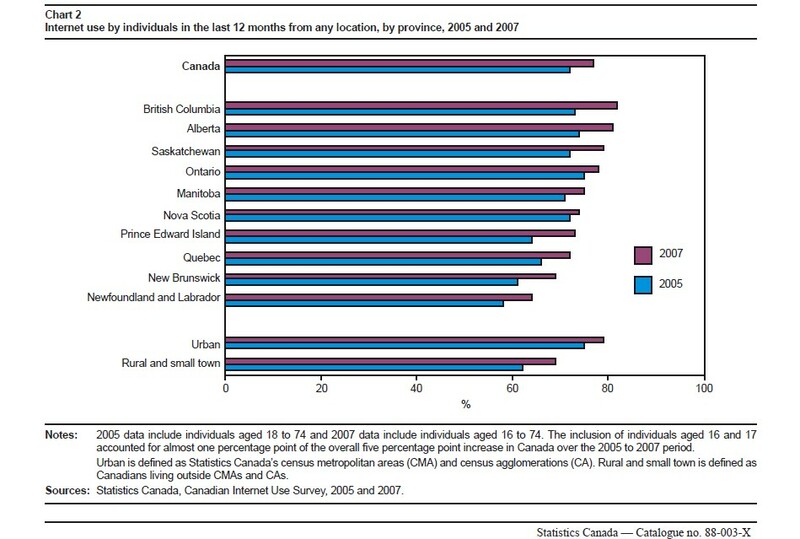 A publication of Statistic Canada relating to this issue provides several charts to show the difference in Internet usage between 2005 and 2007 within each province. These charts also provide information regarding 2005 and 2007 internet usage in Canada’s urban and rural areas in percentage form (Appendix A, D). These charts clearly demonstrated that there is an obvious increase of Internet use between the two year gaps. The tables illustrate that internet usage has grown in all provinces within Canada between 2005 and 2007. Interestingly, provinces such as British Columbia and Alberta that are considered highly urbanized have higher Internet usage percentage than provinces such as Newfoundland or New Brunswick (Appendix A). Moreover, this table also shows that Canada’s urban cities overall have higher interest usage percentages than less developed rural areas. Data from the CANSIM 3580135 also provides similar results. Between 2005 and 2009, the CANSIM data confirms that internet usage has increased significantly in both urban and rural areas (Appendix B). The CANSIM also reports that population wise; British Columbia has more than 3.6 million Internet users province-wide in 2009, while the Atlantic Provinces only have 1.9 million Internet users in the same year (Appendix B). Furthermore, The CANSIM 3580130 table illustrates the fact that Internet usage percentage among urban and rural areas in recent years. For example, the data suggests that over 74.6% of urban residents have access to Internet in 2009, while only 61.9% of people livening in rural areas have access to Internet in 2009 (Appendix C). 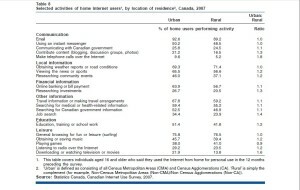 Last but not least, these tables also detailed how other factors, such as age, gender, and education affect on both urban and rural internet users and how urban and rural Canadians participate with internet activities (Veenhof et al, 2008, p29). First of all, internet usage percentage has increased in all parts of Canada from 2005 to 2009, as demonstrated by the charts in Appendix A and Appendix B. In Appendix A, the Statistic Canada’s chart shows that internet usage percentage have increased in all provinces between 2005 and 2007. In particular, British Columbia have increased from an approximately 63% in 2005 to 80% in 2007. The CANSIM data in Appendix B also shows that Internet users in B.C. have increased from 3.31 million residents in 2005 to more than 3.68 million in 2009. Other provinces also had similar increase in Internet users between the four year gaps. There are many reasons for the increase in popularity of the Internet in Canada. For example, the development of new internet technology, such as the wireless Internet and 3G network has allowed more convenient Internet access to Canadians. Furthermore, many public places, such as restaurants (eg: Starbucks and McDonald), hotels, and schools now provide free high-speed Internet access to the general public. This allows the Internet to be used more broadly, not limiting internet access to only homes or workplaces. Similarly, many portable electronic devices, such as tablets, gaming consoles, and smart phones all support Internet access. The advancement in portable electronic devices has allowed more convenient and timely access to the World Wide Web for Canadian residents (2010, p.1). Last but not least, traditional services, such as bill payments, flight bookings, and car rentals can all be done through internet in a speedy manner. Next, provinces that are more modernized have higher Internet usage percentage, as demonstrated by the chart in Appendix D.
Canada Year Book (2011) reports that 85% of the populations in BC and AB have internet access, making them the national highest in terms of Internet usage percentage. People living in Vancouver, Victoria, and Edmonton, the most urban centers in these two provinces, have above 85% internet at home, which is higher than other cities and small towns (p.276). The main reason for both BC and AB provinces to have such high Internet usage percentage could be because that high-speed wireless Internet is more common in cities such as Vancouver or Edmonton. The Daily states that states that there are 88% of households that have access to high-speed Internet, “up from 80% two years earlier”(Statistic Canada, 2010, para12). The Daily also summarizes that in 2010, 81% of households had home internet access who are located in census metropolitan areas, compared with 71% of households outside of this areas in rural town (2011, para2), this also gives support to the fact that internet had already entered into urban Canadian family more than rural residents. Also, researcher points out that the internet participations in urban Canada are greater than those in rural areas because of the high-speed internet services (Dewing, 2010, p.4). The Daily details that over 9 in 10 urban home users start using high-speed connections; in contrast, only over 7 in 10 in rural families. (Statistic Canada, 2008, para15) As urban cities have higher and more centralized population, high-speed internet providers can make a reasonable return from setting up high-speed Internet services for city users. In contrast, population in smaller rural towns is much less than the cities. Therefore, Internet service providers could be reluctant to set up faster Internet services in remote places because the return on investment would be marginal at best. 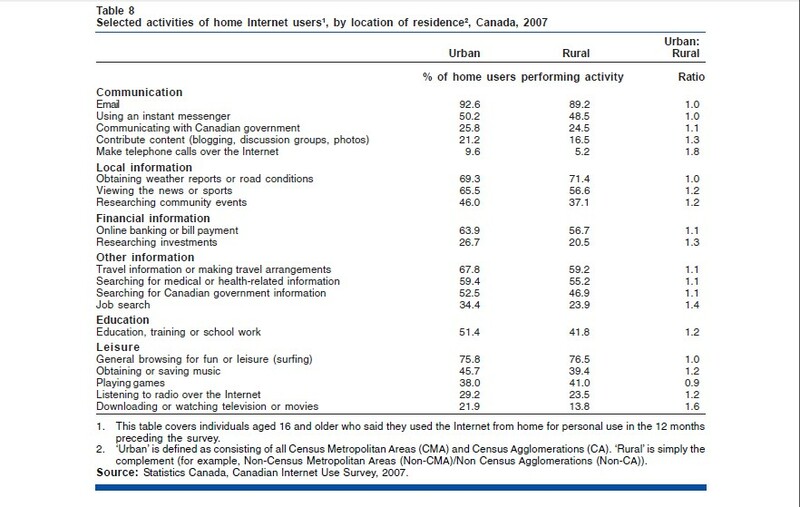 In terms of the summary table by Statistic Canada in Appendix D, it specifics that urban Internet users use Internet for communication more than rural users. There are 92.6% urban Canadians and 89.2% rural dwellers always check email when they use the internet to communicate with others, whereas 71.4% rural users use internet more for the purpose of gathering local information (eg: weather) than 69.3% urban users (Statistic Canada, 2008). The Daily suggests that there is a geographical “independent influence” on Internet usage (Statistic Canada, 2007, para2). As the city leads a busier lifestyle, instantaneous communication has become an integrated part of the urban society. Instant communications are often needed in jobs such as stock trading, which is often located in major cities. In contrast, rural towns are more isolated and focus mainly on agricultural production, hence the need for obtaining road and weather condition updates are higher in rural areas. Official data from Statistic Canada and CANSIM have provided conclusive information that Internet is increasingly becoming more common in both urban and rural areas in Canada. However, a gap still exists between urban and rural areas in Internet usage. Notes from the Library of Parliament highlights the fact that 76% of urban Canadian used internet, while only 65% rural Canadians (Dewing, 2010, p.4). To shorten the urban and rural gap, fast, inexpensive high-speed internet needs to be extended to more isolated communities. CANSIM.(2012). CANSIM Table 3580130: Canadian Internet use survey, Internet use at home, by internet activity, urban or rural distribution.Retrieved 2012 May 27 from http://clouddc.chass.utoronto.ca.proxy.lib.sfu.ca/ds/cansim/displayCube.do?action=browse&a=3580130&lang=. 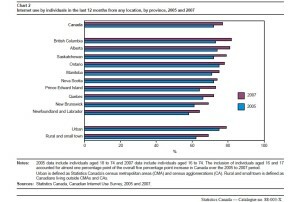 Statistic Canada.(2008). “Socio-demographic factors influencing use of the Internet”. Retrieved 2012 May 27 from http://www.statcan.gc.ca/pub/56f0004m/2008016/findings-resultats/socio-eng.htm.